The Unlikely Voyage of Jack De Crow , by A. J. Mackinnon, Seafarer Books, 2002, 355pp. 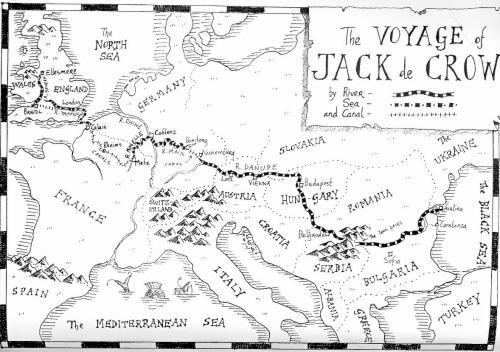 Another man crosses the channel in a small boat, a Mirror dinghy, and also crosses England and Europe, via canals and rivers. Where Channel Crossing was earnest and spare, Jack de Crow is florid and discursive. Sandy MacKinnon is a drama teacher, and you can tell. He wears a pith helmet, until it gets nicked. He memorises poetry and recites it on the water, and makes many literary references, especially to Tolkien (all of which I got, of course). He visits Tolkien's grave, and even C.S. Lewis's. His favorite chapter of The The Wind in the Willows is The Piper at the Gates of Dawn. The literary and historical associations of the Upper Thames are deep -- we should explore it more. Sandy recommends the Nicholson Guide . I remember the very smart lady in the wide-brimmed hat, red as poppies, and a suit more fitted for Ascot than the rigors of lock operating, who insisted on performing the whole operation herself. I simply sat in the boat and called out instructions from below in the time-honored phraseology of canal-boat skippers everywhere. (No, no, you silly moo, et cetera). This lady took me through not one lock, but three in a row, and after each lock produced a box of Belgian chocolates and rewarded me and herself with one each. She also kept up a constant bright chatter about how jolly it all was, and did I regard myself more as a Captain Hornblower or an Arthur Ransome hero. When she finally waved goodbye with a beautiful hand begrimed by the third lock, her smart suit crumpled, her hat askew, she called out "Swallows and Amazons for ever!" In his most memorable Thames story, Mackinnon accepts a tow and a bottle of beer, and is immediately flipped over and plunged deep. He surfaces still holding the beer, and reflects that his priorities are straight. Mr Mackinnon was 34 at the time of this voyage, and you wonder a bit about his personal life. He had been teaching at Ellesmere College in Shropshire, where he got the dinghy. A trip to Bristol turned into a trip to the Black Sea. He now teaches in his native Australia. His channel crossing is a near thing, which he memorably compares to "crossing the M25 on your hands and knees." I paused for a bit in the European section, but there are many great moments on canals in France and Germany. In former Yugoslavia, which is still at war and where people are suffering, he cannot get local currency and must depend on the kindness of the locals for food. An unusual book in an unusual style. Approaching the erudition of Fermor but far sillier, which suited me. P wrote: It sounds like a very good book. Radio 4 had a thing of Kenneth Graham. Apparently Wind in the Willows was written as a substitute for being a good parent to his son. Piper at the Gates of Dawn was also made famous by Pink Floyd using it for their first album cover.